'iPhone 4S' and iPad 3 Coming in Late October? Mac Otakara reports that it has received information indicating that Apple will be introducing the iPad 3 and "iPhone 4S" sometime early next month, with availability set for "late October". The source offered no information, however, on plans for the iPhone 5, although rumors have suggested that Apple will introduce both a revamped iPhone 5 and tweaked iPhone 4 next month. According to sources, iPhone 4S which is based on iPhone 4(CDMA) and new iPad will be started produce since 1st week in September and will be shipped in late October. The "iPhone 4S" name is an unofficial one that has been used in a variety of reports to refer to a new iPhone based largely on and appearing nearly identical to the current iPhone 4, but offering upgraded internal components. What has come to be known as the iPhone 5 is a more thorough redesign which has surfaced in case designs reportedly based on leaked design specs. There had been some confusion about whether Apple would be releasing an "iPhone 4S" or "iPhone 5" this year, with some suggesting that the confusion stemmed from Apple testing iPhone 5 components within iPhone 4 enclosures for secrecy. But others have claimed that Apple will indeed be introducing both the iPhone 5 and a tweaked iPhone 4 as rumors of a low-cost iPhone have continued to swirl. Apple has of course traditionally kept its older models around as entry-level options, as evidenced Apple's continued sale of an 8 GB iPhone 3GS model, but the volume of rumors suggest that Apple may be doing a bit more tweaking to its low-end offerings this time around. Such low-cost models are said to be key for penetrating the prepaid markets prevalent in a number of large countries around the world. Mac Otakara has offered some accurate information in the past, and notably was the first source to pinpoint some of the features of the iPad 2 as case designs began leaking out. A number of potential dates for a media event introducing the iPhone 5 and perhaps the iPad 3 have been suggested, with early reports of a September timeframe being countered early last week with a report from All Things Digital claiming that the device won't be available until October. The latest rumor has, however, claimed a September 7th media event, although an iPhone 5 introduction at that time to be followed with a launch as far off as late October would be outside Apple's usual gap between introduction and availability. i refuse to believe there will be an iPad 3 this year. I find it hard to believe that Apple will have had the iPhone 4 on the market for 15-16 months and is only planning a minor release to iPhone 4S, but 6 months later is ready to release a new iPad that warrants a number upgrade to iPad 3. I'd like to murder the analyst or source who decided to use '4S'. We've gone to sequential numbering now. Even if they slapped a hello kitty sticker on the iphone 4 and called it the iphone 5, it's the freaking iphone 5. If the iPad 3 is coming. Where is the big order for Retina displays? If not, what did they actually upgrade??? 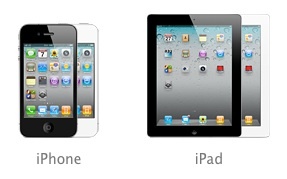 Why would apple release an iPad 3 w/ stellar IPad 2 sales? They wouldn't. Why would they wait a year and a half to release a souped up iPhone 4. They wouldn't. 1) iPhone 4S, if there will be one, will be the lower model. I think it's pretty obvious that there will be an iPhone 5, no doubt about it. 2) iPad 3? No, but an iPad 2 HD makes more sense. Will it happen? I doubt it. With names, I figured the next one would be 4S or whatever letter, 4GS when they put 4G into it, then finally iphone 5 whenever they change the case again. The simplicity is key when marketing. It also makes sense to advance your version numbers as quickly as possible to maintain the perceived lead over the competition. When a customer walks into a store and sees iPhone 5, Droid X 2, and Nexus S2, what sounds like the most advanced model? There is a reason Microsoft named their latest Xbox "360" rather than "2". You don't want to have "Xbox 2" sitting on a shelf next to "PlayStation 3". true, but aluminum is very bad at passing radio signals, which is why many iDevices with an aluminum back have a rectangle of black plastic bitten into it so that it can actually pick up a decent wifi signal. yes but iPhone return rates are still 30-40% compared to about 2% with the droids, it doesn't mater what it's over reception is just one factor that could cause people to return the iPhone. Dude, learn to read. The article specifically says that Android return rates are very high compared to a 2 percent total return rate of the iPhone4. Now thanks for the entertainment, but I'm going to get back to watching The Sopranos now. It's time anyway that this thread gets back on topic. I hate it when people think they are "owed something" when a company releases a new version of an existing product. If Ford has a better Mustang in 2013, do all of the people who bought the 2012 model deserve credit or a "free upgrade"? All you people who bought the Verizon iP4 knew that the 5th gen was around the corner. You made the choice. Live with it.